The first year was a success, and so the club expanded the gift boxes to include businesses in both Isabella and Clare County. Now the group branched out even further. Products in the box come from all over. "From Kawkawlin to Hope to Midland to Harrison to Gratiot County - the heart of Michigan,” says Siers, and that characterization has stuck. Rotary’s “Heart of Michigan” gift boxes are created with two goals in mind - support local businesses and raise money for local and international service projects. The gift boxes are one of the four or five fundraisers the Rotary runs each year to raise money. 100% of the funds raised go to funding local and international service projects. “For example, we help Girls on the Run,” Siers says, “and we’re also helping build an amphitheater in Island Park in Mr. Pleasant.” Girls on the Run is a national program with a chapter in Central Michigan that weaves physical activity, life skills, and relationship-building together into an after school program for 8 to 13-year-old girls. The amphitheater is a project directed by a local high school student, and they hope to break ground this year. Siers is also the chair of the Rotary’s international projects, which include an exchange student program and humanitarian aid projects in Africa. The Rotary also helped fund an HIV/AIDS study in the Democratic Republic of Congo. Not only does he hope that the boxes help raise funds for the Rotary’s local and international projects, but Siers hopes that the emphasis the boxes places on highlighting local Mid-Michigan businesses helps them succeed. 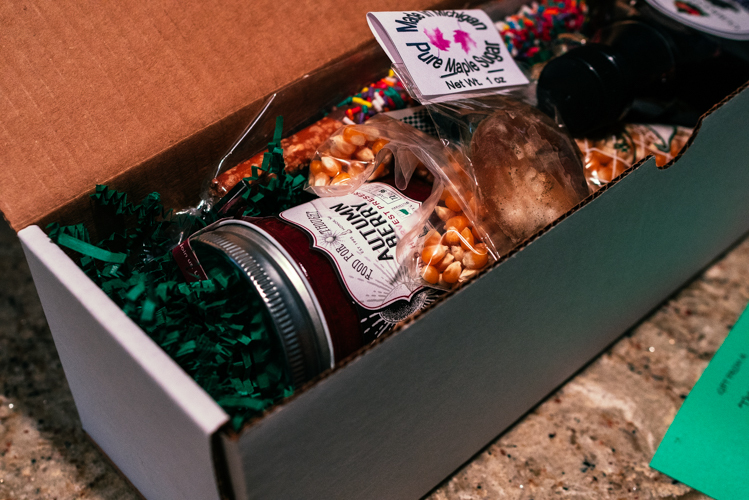 The boxes include everything from candy to handmade cards to artisanal popcorn. This year the boxes include gourmet pretzel sticks from Hope, Michigan, a morel mushroom candle from Kawkawlin, maple syrup and pancake mix from Blanchard, and handmade soap from Mt. Pleasant. Also included in the gift boxes is a jam made from berries on Siers’ own property, “Ugly Agnes’ Wild Autumn Berry Jam”. Inside the box a printed guide also gives information about every item, including contact information for each of the vendors. Last year Rotary sold over 200 boxes, and Siers says they're hoping to sell even more this year. Boxes come in two sizes. Large boxes sell for $35 a piece, or $30 with the purchase of 10 or more. Smaller boxes sell for $20. Boxes can be purchased by contacting any Rotary member or through the Rotary’s website.